It's really quite simple – the instructions are all right here. 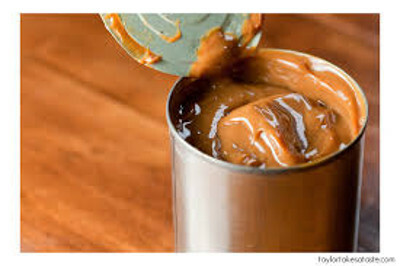 Of course, I took a couple notes For starters, instead of making the caramel, I had several cans of dulce de leche I had earlier prepared. A buddy has a new found, uh, obsession with this stuff, and it's a fun science experiment! Purchase sweetened condensed milk (brand and can size don't matter), peel the label(s), place in a deep pot with a lid (I used a dishcloth underneath to avoid scratching), and fill with water until there is at least a quarter inch of water over the top of the can(s). Bring to a gentle boil, cover, and simmer for three hours – that's it. IMPORTANT: Check often (every 20 minutes or so?) to make sure that the water continually covers the can(s) – if the top dries out, the pressure changes and the sealed can(s) CAN exploded!!! You do NOT want this!!! I kept a pint of water by the stove to add as needed. Remove from the water and let cool at least an hour before opening – serve warm or cold. I did several cans at once – sealed, it stores as long as the original product (dates are usually stamped on the can), and once opened it should be transferred to a jar and refrigerated. Forgot to take a pic as I opened the can, but this exactly it! 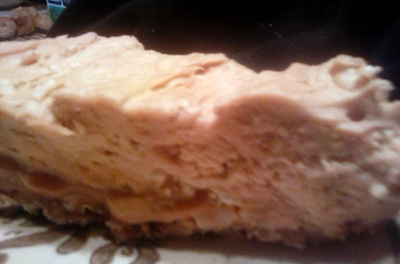 So back to the pie – I'd made the crust earlier in the day – my pretzels pulsed into a combo of chunks and crumbs – I liked the texture of the finished product, but could only spread across the bottom of the pie dish, which wasn't terrible. You might like a finer crumb, so I'm just putting this out there. 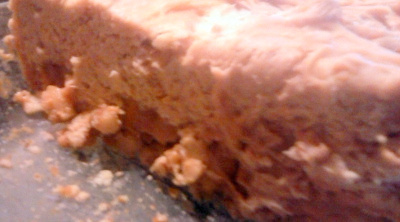 A can of dulce with a third cup of sour cream (instead of crème fraiche) and peanuts makes your bottom layer – I used the nuts straight from the can, but would recommend a rough chop. The peanut butter mousse was super easy – if using a stand mixer, whip your cream first and move to another bowl, then make your peanut butter base – it'll save you time and effort.